When I first laid eyes on the Pilates Reformer, it was anything but love at first sight. The gliding carriage inside a wooden frame connected to adjustable springs and straps looks uncannily like a Medieval torture device. It often feels like one, too. 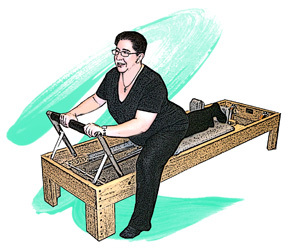 Sitting, kneeling, and lying on the carriage, I push and pull the footbar and the ropes to do low-impact, spring-based, progressive resistance exercises targeting every part of my body, challenging my balance, and building core strength and flexibility. I’m able to work muscles that otherwise do not get exercised; all the while focusing on quality rather than quantity of movement, and on controlled and precise breathing patterns. Some beginner exercises on the Reformer seem relaxing, almost effortless. Enjoy these, because as you progress, the challenge becomes significantly greater. Movements are controlled, sometimes limited to a few inches with a lot of holding. Don’t be fooled by this. The slower you go, the harder it gets. My instructor designed my Pilates routine to specifically address my most disabling PD symptoms. She regularly modifies my exercises and adjusts difficulty levels on the fly to address changes in my symptoms and optimize the benefits of each training session. Her cueing has helped me focus on how a movement feels and relates to my whole body so I can be aware of positioning when completing daily activities. At the risk of destroying my couch potato image, I admit that I look forward to my Reformer training. Week to week I see small improvements in my posture, balance, flexibility, and strength. I take bigger strides, reach better, turn better, and stand taller. 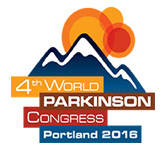 At the end of each session, I am more relaxed and energized, have fewer aches and pains, and have a renewed a sense of well-being… the key to living well with Parkinson’s. Controls breathing to more efficiently deliver oxygen to the body and boost energy levels.